Our range of sanitary pressure control valves provide accurate regulation of pressures in your process. Pneumatic regulating valves that maintain a constant inlet or outlet pressure in hygienic process lines. Thanks to a quick response diaphragm, these compact valves immediately react to any change in product pressure, adjusting position to keep the pressure at preset values. CPM valves feature a self-draining design and the unique diaphragm with PTFE on the lower diaphragm contributes to excellent cleanability. The modular design enables the use of different plug sizes and different flow rates between 0.5 and 110 m3/h provide great operational flexibility. 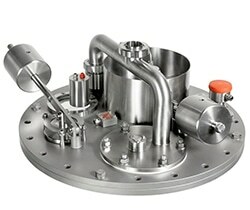 The Alfa Laval SB Pressure Exhaust Valve is a regulating valve that automatically reduces the working pressure in brewery, food, dairy and beverage process tanks as the pressure in the vessel increases. The SB Tank Pressure Regulator is designed for use in the brewery, food, dairy and beverage industries, this regulator maintains and controls top pressure while filling, processing and emptying the tank.